When Microsoft launched Windows 10, it did so mostly with company created applications. These applications, from Mail and Photos to obscure apps like 3D Builder were all listed under all apps in the start menu, and many of them were also highlighted in the start menu as tiles as well. Next to that were five promoted applications which, except for Minecraft, had no ties to Microsoft and were produced by other companies. The apps in question were Twitter, Flipbook, Photoshop Express, Minecraft and Candy Crush Soda Saga. Only Candy Crush Soda Saga came installed while the remaining apps linked to Windows Store where the app or game could be downloaded from. The default start menu layout and application composition is created for every new user account on a Windows 10 system, even on systems running Pro and Enterprise editions. The main reason why Microsoft highlights promoted apps in the start menu is to introduce users of the operating system to apps and Windows Store. It is easy enough to remove those applications from the system by right-clicking on tiles and selecting the uninstall option that appears. Only Candy Crush Soda Saga is uninstalled while the linked tiles are removed immediately from the start menu instead. Administrators who do not want promoted applications to be displayed on systems they manage can disable the Microsoft Consumer Experience. While that option will remain when Microsoft launches the Windows 10 Anniversary Update in July 2016, promoted applications will be doubled (PDF document link). This means basically that users who install Windows 10 with the Anniversary Update anew, or upgrade their systems to that version of Windows 10 from an earlier version of Windows, will see 10 promoted apps in the start menu instead of just five. Microsoft has not revealed yet which applications it will feature in the start menu, only that the count will be doubled and that tiles for Microsoft's own apps will be reduced from 17 to 12. It is likely that the majority of promoted apps will be listed as links and not come pre-installed with the operating system. This is not only done to keep the installation size low, but also to direct users to Windows Store so that they are exposed to it. Judging from the current selection of promoted applications, it seems likely that Microsoft will add apps like Facebook or Netflix showcased in the start menu of the next version of the Windows 10 operating system. That's not necessarily a bad choice considering that these applications are very popular and probably more popular than some of the first party applications that Microsoft showcases currently on the start menu. It depends largely on the type of apps though that Microsoft decides to showcase there. 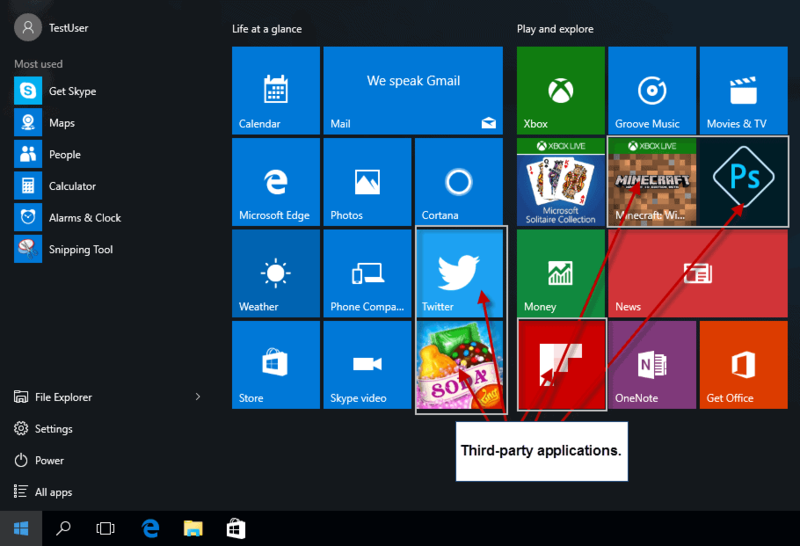 Now You: If you use Windows 8 or 10, do you use apps? Microsoft revealed recently that it plans to double the number of promoted applications that the Windows 10 operating system ships with. And here I was, thinking about installing Windows 10. Glad there’s always more news to keep me from doing it. I use Windows 8.1 Pro and will most certainly not switch to 10, regardless Microsoft’s pressure of “end of free offer”. I uninstalled all Windows Store apps, except for five that proved too stubborn to remove: Camera, OneDrive, PC Settings, Photos and Store itself. I have no Microsoft account (so no OneDrive), and no use for this pre-cooked camera and photos stuff. So of these five, the only “app” I open occasionally is PC Settings. Using the Group Policy Editor, I have completely disabled Windows Store access for my system. Main reason, apart from privacy priorities? I want to work on my own computer, not on some kind of commercial billboard. How do you disable Windows Store access to your system? Seriously though any disabling you do on Windows 10 is only temporary as with mandatory updates Microsoft can re-enable or disable anything they like, as they demonstrated when they removed the ability for admins to disable access to the Windows Store with a recent update. This is not about disabling Store access to the system (which might perhaps be done on a firewall level, I guess) but rather about the reverse: blocking the system from accessing and using the Store. Options #1 and #2 relate to updating/installing Store apps only, so other than the wording suggests, these have nothing to do with general elements such as Windows Update (which can be tweaked elsewhere in gpedit). Option #3 is about pushing an upgrade to Windows 10 through the Store, so will probably be found only in pre-10 systems. Option #4 is of course the essential one. As I don’t have Windows 10 on any of my computers, I don’t know if Windows 10 still offers this same escape route. How many people still use XP? If you use Windows you WILL have to use W10 at some point. Not at all true. You can use XP, 2000 or even Win98-95 forever or until the hardware can no longer support them, if that suits your fancy. However, obviously those systems are now vulnerable to attack and compromise IF they are connected to the internet; less so if conencted to a good router + firewall but the outgoing internet conenction must also be cut off. For greater security: put those machines on a separate network and virus scan anything (USB drives, etc.) that will eventually be plugged into those machines. Same will be true for windows 7 in 2020 and 8.1 in 2023. John in Mtl, you just proved the original statement true. @ Ashrak007 – not necessarily! You can use any variant of any OS that is secure to be online and do whatever you need to do when you have to be connected to the world; but if you still want or need to use older Windows, just keep them off the internet and they will be very safe and fully functional. Do you “have to” use win10 ? NO, not at all. Do you “have to have” win 10 or else your computing world comes to an end ? NO. That was my only point. The problem as I see it is that very often the promoted apps are reinstalled after an update. 3D builder and Candy Crush Soda Saga have come back several times after uninstalling. This is very annoying. But, Microsoft has shown that they simply don’t care. I upgraded this machine to Windows 10 months ago. Many updates have been installed. The apps I removed have not come back. Can you cite which update causes this please? I’d like to test it myself. Krita might be another alternative to Photoshop. Back in January 2015, the Computer Graphics and Art Department of the University of Paris 8 announced that it was switching from Photoshop, not to GIMP but to Krita. Krita is cross-platform and is allegedly very stable and more user-friendly than GIMP. However, I’ve never done graphics work and don’t really follow tech news in that area, so don’t take my word for it. In Linux, I believe it’s designed for KDE and is difficult or impossible to configure for other desktop environments. answering your question Martin, nope, I don’t use windows apps, applications ALWAYS, why’s that? they start in full screen and I like the freedom of moving the application to where I want, to resize the window, etc. MS Windows has always had the ability to be customized to suit the users preferences, especially in cosmetic or visual terms. Third party programs and utilities have proliferated since Win95. It’s a two edged sword from Microsoft’s perspective. Each release/update to the operating system incorporates more and more “functionality” built into the OS itself. Today, with Win10, the OS is tasked with a whole slew of functions that used to require separate programs to accomplish. The umbrella of the “OS” has certainly grown rather large under this model, and that may or may not be a good thing. This growth of OS umbrella causes some problems for Microsoft. Updating, for one. Let’s use Windows 7 as an example. There are a LOT of Win7 installations. The OS is mature, and users have tweaked, modified, customized, added third party options, to get Win7 just the way they like it. Back at MS, they are getting ready to release an update, perhaps an important security patch. The systems they are using in Redmond for testing are Win7 systems with all patches, updates, etc. installed. They are current. That’s saying something when you are dealing with an OS that’s been in use for a decade. The problem is, they can’t know if YOUR Win7 system is current. They can’t know what tweaks and third party stuff you have running. They release an update that works perfectly on their totally current Win7 test machines, and well, when it gets to you… It blows up. You can fix this in a number of ways. Lock-down the OS, take away customization, force users to do it your way or the highway… Stifle innovation and prohibit 3rd party installations. I don’t think that would go over very well. Win10 attempts to fix this by delivering updates in what is perceived as a “forced” mode. I’m not so keen on that idea either, but I can understand it, especially when you consider the breadth of the Win10 umbrella. Deliberately and automatically removing “incompatible” 3rd party programs is another way to “keep everybody” on the same page… And no, I’m not real keen on that process either, but again, I understand the motivation. All this will lead to a lot of screaming and yelling. If you try to please everybody, you will likely please nobody. I give MS a certain amount of credit for attempting to continue to innovate, to continue to allow end-user customization, and yet find a way to reliably update systems and attempt to keep “everybody on the same page”. It’s a complex problem, made even more so by the desire to do this on a plethora of physical devices… Phones, tablets, laptops, all-in-ones, desktops and servers! Sure, you can grab a copy of Win10 Enterprise, or even Win10 Enterprise LTSB. This will have no “Store”, and a fully functioning Group Policy Editor allowing you to turn off telemetry altogether, and with LTSB you might be able to reduce updates to something on the order of once a year. But what do you give up? All the exciting and fun stuff done with desktop, action center, taskbar, a multitude of visual and operational features, additional settings menus, etc. That’s if you run a traditional desktop PC. If you are a surface or tablet user, you give up even more functionality in the realm of tablet mode, gestures, etc. So, no, as much as I like some of the things Win10 Enterprise LTSB turns off, I give up too much new and exciting stuff to make it worthwhile. The machine I’m writing this on is a hefty desktop on the Fast Ring. It has a MS account and by default everything is “on”. I’m getting all that MS has, and I’m giving up a great deal back to MS. There is no privacy on this machine. In fact, a few weeks ago Bing rewarded me with $10 deposited into my MS store account! (I’ll likely never use it). My point? This is a test machine. I wouldn’t want ANY sensitive data anywhere near this machine. MS has hooks everywhere. I have a network monitor, and when this machine is sitting at idle, running nothing except OS related internal processes, you can just watch the data flow… Incoming and outgoing. Continuously, 24/7. Obviously, this “flavor: is not the answer. 1) Turn off “Customer Experience” (assuming this will still be allowed). 2) Use Powershell Commandlets to uninstall any unwanted built-in apps. 3) Run something like “O&O’s shut-up-Win10”. 4) Configure Group Policy (for Cortana). And probably a thing or two I’m forgetting off the top of my head. This is STILL way too much work just to get a decent OS going. MS needs to offer a way to keep what you want, and disable what you do not. Future updates need to be able to read and respect these user settings. Everybody can still be “on the same page”, but each person’s page will consist of a unique collection of settings. The problem you describe of Microsoft trying to get everyone on the same page is entirely their fault, going all the way back to Windows 95 their operating systems have never had proper package management, i.e they can’t add or remove code from Windows without the potential for it to cause problems, since Windows 95 all they’ve been doing is adding code on top of code, on top of code, on top, well you get the picture. If Windows had a proper package management system they wouldn’t have to worry about everyone being on the same page as there would be proper version checking and parts of the OS could be added or removed as needed without an updated or patch causing problems. A classic example of how awful things have got with Windows is talked about in the following short video, believe it or not Windows 10 still has remnants of DOS code in it causing problems and it can’t be removed because trying to untangle the code dependencies is next to impossible. I jumped a little on your text Joey because it’s just a huge text, but I feel you man. but what I feel even harder, is that we are becoming what videogames say, seriously. do you see those videogames like, for example, Mirror’s edge, where, on that game, EVERY building is painted white, and everybody follows the rules, there is no personalization basically. the computers have all the same color, the lights are all white, etc etc etc. Why not force people to use only Store apps and remove desktop apps? That is the only move left by Microsoft now. You’re describing the now defunct Windows RT, that foolishly looked exactly like Windows 8 but did not allow desktop programs to install. The return rate was phenomenal as consumers don’t want it. So, it was killed off. People need to run the programs that they already own, like Quicken and many others. Lo & Behold, Candy Crush Soda Saga… every CEO needs it, as every IT Manager or Software Developer. Currently, this OS by microsoft was the culprit for me. Now I administer such silliness for others and personally use other systems. Candy Crush Soda Saga, really? I’ve read countless articles and comments about Win10 and not a single one has ever inspired me to give it a try. In fact, about 95% of what I’ve read or seen only strengthens my determination to stay clear of it. Even the screenshots that I’ve seen are an instant turn-off. Generally speaking, I run Linux and have been for about 16 years now, but Windows is still an unfortunate requirement at my office, so while I generally build my own machines, an emergency situation at work the other day required that I quickly purchase an already assembled machine. It came with Win10-pro, but I immediately “upgraded” the hard-drive to Win7-pro and took certain steps to make sure it stays that way before ever connecting to the internet. Perhaps there is hope for the eventual Win11 or Win12, but it seems highly doubtful. If you’re strongly opposed to Windows 10, IMHO you’re depriving yourself of a cool experience. If you need Linux for some set of applications, that’s fine. However there are many great features of Windows 10 you’re missing out on if you just concentrate on its flaws. I’ve used many operating systems on PCs as well as mainframes since the 60’s, and suggest you reconsider Windows 10 where potentially appropriate. I would be real curious as to what the “great many features” of Windows 10 that you refer to are. Cortana? One of the first things I would do after installing Windows 10 would be to disable it, just as I did Siri on my iPads and Google Now on my Android smartphones. OneDrive? Could never get it to work on Windows 7 nor Windows 8.1, so I would disable that as well. Dropbox and Google Drive both work just fine. Universal apps? I would never use them. What other “features” are there? “Features” like being monitored, your data uploaded to the cloud while forced to use Metro “Apps” ? I traded all my Store apps for the AB Roller Plus and now i can do sit-ups and crunches without spraining my neck! order now and receive a free OS ! The Metro (Modern) interface Windows 8-10 serves apps in, most ugly and horrible interface abomination I ever seen, is the main reason I’m not going to use Windows 8 – 10 for as long as I will be capable to avoid them. I don’t use the Metro (Modern) Interface at all. I do use a few programs that were last updated in the 90’s (without compatibility problems), but generally use the x64 latest stable version of an application. My primary browser is Chrome, but on rare occasion I have to run a particular URL based application in IE11 or Firefox. To me, Edge is still alpha code, so I don’t use it, and have Cortana turned off. Google Drive and OneDrive work fine in Windows 10 for me, as do many tens of other programs. For graphics work, the Linux ports to Windows programs GIMP and Krita work quite well for me. However since no program does everything well, I also use IrfanView, Paint.NET, and Phocus. My point is not to list everything I run on Windows 10, but simply to indicate there applications and modifications to Windows 10 that make it the best Windows OS to date for me. It ain’t perfect by a long shot in both design and implementation, but what OS ever has been? Were you “forced” into using Win10, or did you have a choice? That, to me, is the point. I “choose” to use different operating systems on different computers, depending on the primary function of said computer system. As you imply, no OS is perfect, but being “forced” to use a system that you don’t want or like, on a computer that you’ve invested your money in, is just plain wrong. I think that peeps would have less of an issue with this, had MS given users control over how there computers were to be affected; but no, most of us have to rely upon the good will of people such as Steve Gibson and Josh Mayfield (to name but two, and my thanks go out to these good people) as well as many other diligent researchers to restore some control and choice. It’s bad enough that you have to build a new system from parts, if you want a choice about the OS (I know there are exceptions, but I’m talking in general, for your average computer user) let alone that having made that informed choice, MS thinks it has some God given right to overrule that decision without any agreement from the user, forcing many people to simply scrap a system that can’t handle the new OS, but is in every other way, a perfectly good system. I feel for the less well informed people, people that don’t even know that they have a choice, people who will simply accept the “upgrade” then have to invest in a new computer when they find out that the system they have is just not up to the job, but was perfectly fine running, say Win7. Then were supposed to believe that we live in a democratic society: democracy is an illusion; we are all dictated too, day in, day out, and this is just another example of how that system works. I use Windows 10, but I have not been bothered by any apps or promotions. This is why: I use Classic Shell, a freeware start menu replacement. It’s been around for a long time and I will vouch for the most recent version — 4.25 — being stable on Windows 10. I don’t need Microsoft telling me about their apps. Besides, their ‘new’ start menu is ugly and counter-intuitive. I think it’s all going to backfire. As far as I am concerned, they shot themselves in the proverbial foot.